Many years after his (second) death, Frieza’s empire is starting to crumble. His forces are dwindling, growing weaker, and are spread too thin trying to maintain control of his vast number of holdings. In a bid of desperation the new leader of the Frieza Force, a dimunitive alien named Sorbet hatches a plan to use the wish granting Dragon Balls to bring Frieza back to life. Having failed to track down the remaining Namekians, Sorbet succeeds after convincing the now youthful Pilaf, Mai, and Shu to let him use the Dragon Balls after the trio gathered them all. Frieza is revived by Shenron and then resurrected from the piles of Jell-O that he was reduced to via new healing technology made by the Frieza Force in the years since his death(s). Upon being told that Goku has grown vastly more powerful since the last time the two fought, Frieza decides to do something he’s never done before in his life; train. Now much stronger than he’s ever been, Frieza sets out to exact revenge against his old Saiyan nemesis. 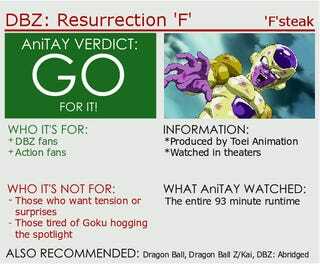 Does Resurrection ‘F’ make Frieza’s revival worth it, or should some things just be left alone? The vast majority of this film is fight scenes. Starting with a glimpse at Goku and Vegeta training under a new teacher and culminating with the fight against Frieza, there is little time in this film where punches and energy blasts aren’t flying. The film rightly chose an existing foe from the Dragon Ball canon to focus on, because this allowed the set up to be done and over with relatively quickly. 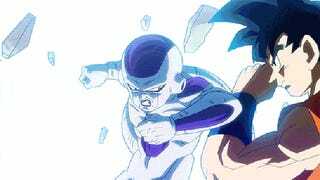 Besides the scenes leading up to Frieza’s revival, the only other set up scenes of note was a brief collection of scenes showing what some of the characters are doing, and the introduction of a relatively new character, Jaco the Galactic Patrolman. In addition to the fight scenes being plentiful, they are also beautifully animated with a great sense of choreography not seen in the television series, obviously for budget reasons. Gone are the trademark rapid exchanges of punches and in their place are methodical punches, kicks, and martial arts throws that look painful as all hell to be receiving. Obviously, by this point in time none of the human characters in DBZ are strong enough to stand up to Frieza even before he trained, though I think Tien might have been able to hold his own in a pyrrhic victory over a pre-training Frieza, considering he had an impressive last stand against Semi-Perfect Cell way back when, albeit one that relied on him draining his life force to do so. But Frieza now easily eclipses all of Z Fighters that gathered to hold him off until Goku and Vegeta return, even Piccolo and Gohan (who has, logically, regressed in skill and strength because he’s stopped training and grown out of shape). Luckily for them, Frieza only wants to fight Goku for revenge, so he doesn’t even bother fighting the Z Fighters, and instead sends his 1,000+ troops to fight them. This leads to, in my opinion, the best sequence in the film as there is a great sense of scale to the fight, and the Z Fighters each have their own unique skill sets, and they all get to bring out their signature attacks. Even Jaco gets involved in the fighting, and he has one of the weirdest fighting styles I’ve ever seen in Dragon Ball, which is definitely saying something. Resurrection ‘F’ is, quite honestly, a hilarious film, with the comedy sprinkled throughout the film to great effect. But oddly enough the humor wasn’t as so much in line with the typical Akira Toriyama comedy, but more like that found in the Dragon Ball Z: Abridged series, with some of the funniest moments being just random one-off lines that the characters would say either for the weirdest reasons or with an odd tone. That being said, Toriyama’s own comedy is still clearly there as well. Also it should be said that, funnily enough, TeamFourStar did have a small hand in this dub, as Scott “KaiserNeko” Frerichs from TFS voices one of Frieza’s random mooks in the film. Now I know I praised the film for its more focused cast, and I still think that was a wise decision on their part, but there are two character exclusions that stand out like a sore thumb, especially because they are strong characters. First and foremost is Majin Buu, who, sad to say Buu fans, doesn’t even appear in the film. They name drop him several times in the film, but do nothing with him. I would have loved to see Buu run rampant on the Frieza Force. What makes it worse is they never bring up an excuse as to why he’s not used. The other exclusion has an excuse, albeit an extremely stupid one. The character I’m referring to is Android 18, who distinctly points out she’s stronger than Krillin, but Krillin tells her to stay home and watch over Marron. They could’ve left Marron at Kame House. Or with Videl. Or with Chi-Chi. Or Korin and Yajirobe. Or the Briefs. Like right there is five different, safe places they could’ve taken Marron to so Android 18 could’ve joined in the asskicking. Much as I liked seeing Tien and Master Roshi back in action, I would’ve easily dropped them for Android 18 and Majin Buu in an instant. Now I knew about the stupidly called Super Saiyan God Super Saiyan transformation going into this film. How could I not? It was all over the media coverage regarding this film. I don’t have a problem with the form in and of itself. I really don’t. I just have a problem with it just suddenly.....appearing. Goku just transforms into it without any fanfare, nor any hint that he achieved this state. He just....has it, and something about that just rubs me the wrong way. The entire time Goku is fighting Frieza, they keep bringing up that Vegeta is supposed to eventually tag in and gets his chance to fight the man that has caused Vegeta so much pain and suffering throughout his life. So when Vegeta finally does get his turn to bat, I was hyped to see one of my favorite characters finally come full circle on one of the major parts of his character. And.....Vegeta only got in a few punches and almost an energy blast, before the whacky hijinks of the ending come into play and it is ultimately Goku who gets the kill. And that pisses me off. Thematically it would have made sense for Vegeta to finally get his win against Frieza. Goku, his rival, beat Frieza the first time, and Trunks, his son, beat him and killed him off for real the second time. This was Vegeta’s moment, damn it! Thanks to a certain food loving character introduced in Battle of Gods having a deus ex machina power introduced early in the film, there is no tension in this movie. Anyone paying attention will know that anything bad with a lasting effect that happens in the film will ultimately be undone. And that’s before touching upon the villain being Frieza, a foe that’s already been dispatched multiple times. 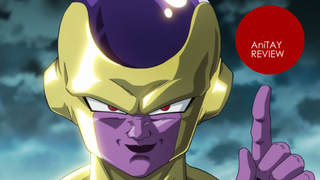 Unlike Battle of Gods that gave us a wildcard in the form of Beerus, we know what we are getting from Frieza. Even a powered up Frieza is still going to be an egotistical tyrant who at the end of the day will be dispatched. Despite there being many flaws in Resurrection ‘F’, I feel the good greatly outweighs the bad. It is not a perfect film by any stretch of the imagination, but it is easily my favorite Dragon Ball Z film made to date (though that’s honestly shallow praise cause, let’s be real, many of those films kinda....sucked) and it was a great nostalgia trip that rides on the coattails of one of my two favorite arcs in DBZ (the other being the Cell Saga, because, well like I said, major Gohan fan here). In the end, Resurrection ‘F’ is unquestionably one thing, and that is fun. It’s the most fun I’ve honestly had in theaters this year so far, and I urge any and all Dragon Ball fans that have it playing near them to see it, for this is fanservice in its truest form. Dragon Ball Z: Resurrection ‘F’ is based on the completed manga series Dragon Ball by Akira Toriyama, it has been licensed by FUNimation and is currently in theaters on a limited release, with a home release sure to follow in the future.